If you read my last update you’ll know that I had been aiming for my Club 10 award and didn’t quite make it so I was determined to get it this week. I’ve been right back on track, mostly under my syns with the exception of one day (Sunday) but it balanced out during the week and I only used 90/105 for the week so I was hoping for a good weigh in. One of the things that has helped me get back on track is one of these diaries. 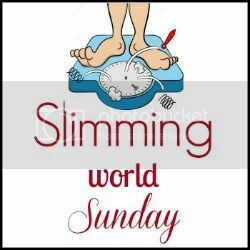 It’s not an official Slimming World one but it’s helped me as I’ve written everything down and it’s in a uniform manner rather than just a load of scribbles on paper (!). I think I will get a different page style next time though as I think the one I have is more for EESP. I’ve decided I’ll start showing you some of my meals in these updates too, that I’ve shared on Instagram during the week (feel free to follow me if you don’t already!). Anyway, on to weigh in. I went to group feeling really hopeful for that 1.5lb loss to get my Club 10 award; I went for a pee before I left home and when I got there to make sure I was as empty as can be, ha! I really didn’t want to look at the scales but I can’t help it – I did and I saw that I hadn’t quite made my Club 10, with 1lb loss again. I was pleased though as I thought even if I get the same again next week, I will finally be there! I just noticed my consultant has written my total weight lost wrong as it should be 1st 4.5lb – I will have to change that! Though I’m actually going for a 2.5lb loss next week so I can get my 1.5st award too – wish me luck! Well done on your loss this week and your food all looks amazing! Especially that cheese on toast! Good luck for next week! Well done on your loss. I too have my eyes on my Club 10 award but has been eluding me for the last few weeks!!! Well done on your loss 1lb is still incredible over a year that's 52lbs do keep it up! Well done on your loss! Those chocolate orange square look AMAZING! They were really really tasty! Thank you!